This true tale begins in 1937, before I was born, when two young friends decided to join the Air Defence Cadet Corp, the forerunner to the Air Training Corp. Both were passionate about everything to do with aircraft so decided to find out more. Both friends lived in East Brighton, one in Whitehawk Road the other around the corner in Rugby Place. The nearest ADCC centre was in Norton Road in Hove and to get to the centre the friends cycled. They had to attend for two evenings per week, Mondays for technical training at Norton Road and Thursdays at Marmion Road, also in Hove, for foot drill. During their membership their particular interests started to emerge one liked the technical aspect and for the other there was nothing but flying. As the war clouds started to gather more young persons were encouraged to join cadet forces linked to the armed services. This gave the armed services ready access to young people when they became old enough for regular service at the age of 18. In 1941 when the two friends became old enough they both decided to enter the Royal Air Force. The one with the technical bent was part way through an electrical apprenticeship with the local firm of Braybons, so he decided on a ground crew trade of aircraft electrician. He was not accepted for flying duties owing to the fact that he suffered form persistent nosebleeds. The second friend was able to fulfil his dream by being accepted for aircrew training as an air gunner. At this point their paths took different routes, one to technical training the other to flying and gunnery training. As both types of training took place at different locations the friends were physically separated but retained contact by letter. to be on the same air station but the two locations were some thirty miles apart. The air gunner's training had taken considerably longer than his friends so he did not arrive on his squadron until the autumn of 1943 the electrician having joined his in 1942. Despite the disruption of war the two friends still communicated by letter but had still not been able to meet up. One day whilst working on the electrics of a Halifax bomber, for this was the type that both squadrons operated, the electrician heard a voice he knew very well, it was his friend the air gunner. The gunner's aircraft had been on an air test and had landed at the other station and the gunner had insisted on visiting his mate. During the visit they decided that they would try to arrange their next home leaves together. The two friends agreed that they would try to have their leaves in early April of 1944. The air gunner, in a letter sent on the 20th March, mentioned how good it was going to be to meet up in the old haunts of Brighton and play Snooker. Sadly the joint leaves did not take place for on the 22nd of March the aircraft with the air gunner in the rear turret was shot down over Frankfurt in Germany and all the crew, with the exception of the bomb-aimer, were killed. Obviously, the news of the gunner's death was a great shock to his friends and heartbreaking to his mother who was a widow and he was her only son. Finally the war ended completely in August 1945 and the electrician was finally demobbed in 1946. He returned to his home in Brighton, which was now in Fletching Road on the Whitehawk council estate. He joined his mother, father and five-year-old brother facing the austere post war period. He and his family never forgot his friend the gunner. The rest of the family also remembered him for he had visited them during his leaves. The young brother of the electrician had always treated his big brother as his personal hero. When he first learnt to speak and unable to pronounce RAF, on being asked where his big brother was would eagerly state in the "arf eff". He remembered the anticipation of his hero coming home on the very infrequent home leaves with great affection. Lying in bed unable to sleep until he heard his brother's voice then rushing downstairs and launching himself into his brother's arms. Sitting on his brother's knee and feeling the rough Serge of the uniform material on his bare legs and the smell of the cleaning fluid used to keep the uniform in pristine condition. The young lad even retained hazy memories of the other hero, the "boy in blue" who visited but was no longer with us and would not come home. Sadly the electrician did not now exactly where his friend's aeroplane had crashed but he thought that it was near Frankfurt on Oder. This being the case he could not have visited his grave as Frankfurt on Oder was now in the Eastern area of Germany. Having these two heroes in the RAF the electrician's young brother grew up with a great interest in all things to do with air travel. As he grew older he became determined to discover the truth of the death of the air gunner both for himself and for his brother. In the beautiful city of York is an ancient area full of intriguing shops the area is called "The Shambles" one particular shop of interest is a bookshop with a whole section dedicated to the wartime bomber airfields and RAF squadrons that were located in Yorkshire. While visiting York in the 1980's the electrician's young brother had a strange experience. Whilst visiting the bookshop in The Shambles he happened to be browsing through the section on the airfields and squadrons he saw a book entitled "In Brave Company". Skimming through the book he noticed a section containing photographs and there amongst them was one taken of a crew, in typical wartime pose, with their aircraft behind them. On studying the photo a face from his memory came to the fore, it was the air gunner. Of course he purchased the book. While reading the book he discovered the names of the rest of the crew, the serial number and the aircraft code and where it was shot down. This turned out to be not Frankfurt on Oder in Eastern Germany but Frankfurt on Maine in Western Germany. At the same time as finding the book the Commonwealth War Graves Commission had opened a web site containing the Debt of Honour list of all persons killed in World War One, World War Two and other conflicts. The electrician's young brother opened the web page, entered the information requested and to his delight, found the details of the air gunner and where his grave was located. On taking semi-retirement in 1997 the electrician's young brother decided that he would visit the grave. This visit was to pay respect on behalf of his brother, who suffering from arthritis was unable to travel, and his mother and father who were by now both deceased. In 1998 equipped with the book and the last letter written by the air gunner the electrician's young brother stood by the grave of the 19 year old air gunner located side by side with the other five members of his crew. The location was the Commonwealth War Graves cemetery in Kleve on the Dutch German border. His ambition had now been achieved he had made the link back to East Brighton for the second of his heroes. The air gunner had in a way come home. Although now being a man of mature years the electrician's young brother could not deny that the wetness of his eyes or the tears on his cheek were from emotion rather than the wind. The bookshop in York was to be the site of another eerie experience for the electrician's young brother, but that is a subject for the future. By the way the air gunner was Kenneth Oclee, the electrician was Percy, (known as John) Lander and the young brother, you've guessed it was me, Vic Lander. This page was added on 15/05/2007. A very touching story, well written. (Keep up the good work) I remember you telling me about it when we last met. 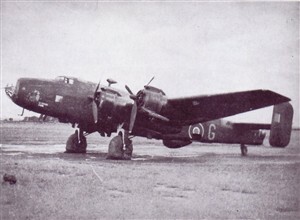 came to Speke as a student on my course - most electricians in Bomber Comand Halifax Stations did! Apologies for late reply. I did not realise thet Ken Oclee had any relatives. I understood the his mother died soon after he was killed from what was said to be a broken heart. As my story states he was a best friend of my brothers but I just about vaguely remember him as he would visit my family on his leaves. As I understood he had no relatives I decided to ensure that he was not forgotten. I located his grave and visited it, I devote a cross in the field of rememberance at Westminster every year and I devote a further cross locally here in Brighton. I have his last letter that he sent to my brother, as far as I can tell the letter would have been. Written within days of his death. His name appears on a memorial plaque located in St Marks Chapel in Brighton, the chapel has become part of St Marys Hall School. With the demise of the school I have contacted those now responsible for the future of the Chapel to ensure that the plaque is not lost. Should you or any surviving members of Ken's family wish to see his final letter please contact me.